I think Karin Stevens likes puzzles. Or more accurately, she likes metaphors. Her vocabulary rarely includes vernacular or pantomime movement yet has for quite some time now always anchored itself to images that are firmly concrete. Her recent piece with the University Chamber Singers was as linear and narrative as dance comes in these days of kitchen sink immersion dance theater thingies. Before that, her work with Craig van den Bosch seemed at first blush more abstract yet the mathematical imagery both danced and projected was as finely detailed as any Julia set extrapolation. In both those cases the music limited the pieces in some sense. Both scores for Point of Departure, the Vivaldi of the original and the Craig van den Bosch electronic score of the final version, posed the problem of structure: too much, I think, in the Vivaldi and too little in the van den Bosch. Similarly with the Britten music of A Boy is Born. What her work has always desired was a music that was both free and structural, improvisational and compositional. Ms. Stevens’ work tends to be rather intricate and is often poised delicately on an edge between austerity and solemnity. Ms. Boshnack’s music, with its multiple layers, counterbalances this tendency, and lends some humor and wit to Ms. Stevens’ work, allowing her to explore freely on any level she chooses. Here the music allows her to push her work even closer toward abstraction while retaining a certain level of implied narrative that can be viewed multiple ways. The closing piece, Dormant-Exploding Syndrome-Ashcloud, shows exactly how well this all comes together. It would be simple, too simple, to read the title literally and perform it as an animated version of a little-known sleep disorder. Instead Ms. Stevens goes for every level of metaphor she can extract from the title, all things quite meaningful to a Pacific Northwest denizen: mountains, volcanoes, cataclysm, scorched earth, and flowing fire of course, but also disease, irruption/eruption, suppuration, oozing… That her dancers understand the piece and accord with it so well is a tribute to Ms. Stevens’ newfound certainty in her direction. They respect the mystery, and so they honor it. And what a lovely direction it is. Ms. Stevens has always struck me as an earthbound choreographer but nowhere in her repertoire have I seen her explore the earth as a truly elemental force as in this evening. And just when it seems that the accumulation of images will collapse under gravity, in floats Ms. Boshnack’s ethereal brass tone or Ms. Beth Fleenor’s woodwind wail or Max Wood’s extraordinary percussion snaking in and around the downbeat, and suddenly the dance becomes as light as air and as polymorphous as water. Structure becomes fluid again, to be reconstituted anew with the next series of images, each of them leading but never disclosing before they disappear into the music. 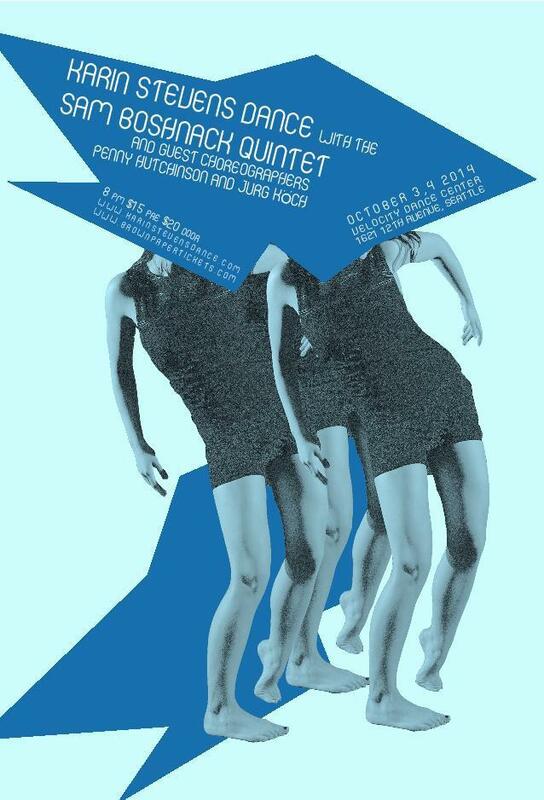 Quartet disintegrates into unbalanced trio and solo, then reforms into duet then again into quartet, all the while Ms. Boshnack’s quintet rearranges and reforms itself in various combinations as well yet somehow always holding steady. Ms. Stevens has been pushing in this direction for quite some time. I’m happy to see her get there. She is ably assisted by the exquisite Emily Durand and amazingly pliable Eileen Wingfield in Free-Flow Interchange, where her connection to the earth yields to her love of the water. And yet this piece is even more tightly structured than Dormant-Exploding Syndrome-Ashcloud. Again, however, the structure of the dance plays with the freedom of the music, and each seems to impel the other toward equilibrium–water always seeking its own level, so to speak. Ms. Boshnack’s music also lifts the choreography of the other collaborators, especially Jürg Koch. His piece is amazingly fine, certainly the most appealing work of his I have seen. Inspired by the interplay between syncopation and groove in Miss Boshnack’s music, he has created a piece that plays with group time and individual time, unison and division. For the first time ever while watching one of his dances I could sense an honest joy in the work, along with his trademark dry wit. It was truly a pleasant surprise to watch and I do hope he works in this direction more in the future. Penny Hutchinson’s piece, too, captures the joy and beauty that often hides within Ms. Boshnack’s music. Its play of two halves, one duet and one quartet (or duo of duets, as the mood strikes), strikes me as a loving, affectionate tribute to partnership of all kinds and is truly gorgeous to watch. I am impressed with Ms. Stevens and her dedication to reuniting music and dance in her own unique way. 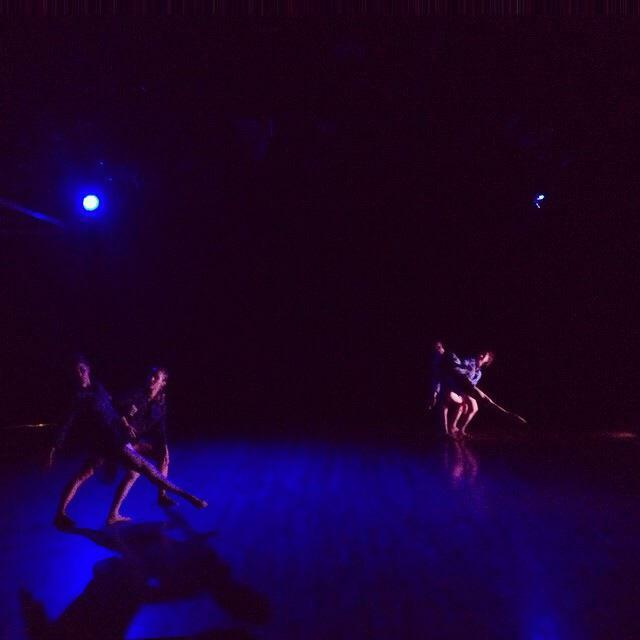 With so much music for dance being piped in, devised as an afterthought, I have been longing for a healing, mutual respect between the arts once again. It’s been a long time coming. And I’m happy it’s arrived. Let it continue.